Sometimes I post covers to Paperback Flash because I’ve just finished a great book and I can’t wait to tell you about it. Other times I post a quick synopsis of a book I will surely forget in the next few months, and the post here is a mile marker for my memory when I’m later reading other works in the same genre or by the same author, in which case my posting here is almost purely for myself. And other times, as a service to the community, I like to post covers featuring green-haired women bearing their giant breasts. This beauty comes to us from the pen of one Ken Barr, on the glorious year of my birth, A.D. 1975. 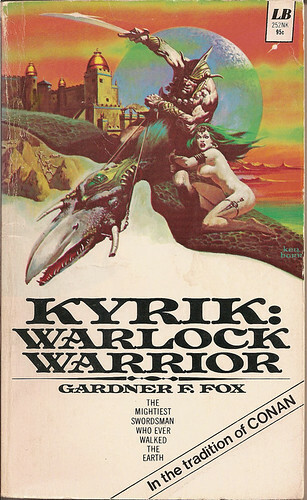 The subject (other than the woman and the awesome flying dino-horse) is the eponymous KYRIK: WARLOCK WARRIOR, the second of Gardner F. Fox’s Conan clones. I’ve sampled a bit of Fox’s first barbarian hero, KOTHAR, and was surprised by the originality of it, despite the fact that the main character is a carbon copy of Robert E. Howard’s famous warrior. Kyrik, as I understand it, leads slightly darker adventures, and has some sort of demon sword (which probably makes him more of an Elric clone). I haven’t had a chance to read any Kyriks, though I’ve managed to track all of them down over the last few years. They don’t all have covers like this one, unfortunately. A quick word on Fox before I leave you to enjoy my Monday holiday. If the name sounds a bit familiar you probably know him from his extensive comic book work, which spans the late 1930s to the modern era (Fox died in 1986). He invented the concept of superhero teams with the Justice Society of America, invented heroes like Hawkman, re-invented most of DC Comics’s stable of heroes (Green Lantern, Flash, etc.) in the early 1960s in tales that ushered in the “Silver Age” and then he teamed up all of the best ones in the new Justice League of America, which still exists in some form today. Fox was sort of the Stan Lee of the DC Universe, and comics fans justifiably canonize him as one of the major early authors in the field. But he also wrote his fair share of pulp, and a lot of it will wind up here on Paperback Flash in the months to come. Very cool post – Thanks Erik!